1. Gather your favorite recipes in one place. 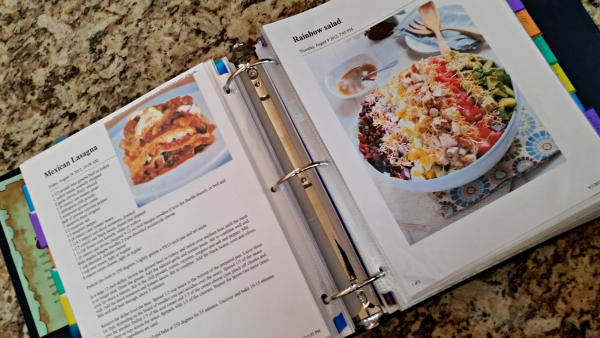 It’s a lot easier to plan your meals if you have a nice collection of recipes to work from. This can be a 3 ring binder with all your recipes, printed out, a recipe file, or, my favorite, an app where you store all your recipes. I like Paprika and Chef Tap because I use a lot of recipes from Pinterest and these are the easiest apps for importing recipes from the internet. Once you have all your recipes organized and in a place that’s easy to get to, you’re ready for the next step. 2. Find Out What’s on Sale. If you just run to the store, fill your cart with what looks good, regardless of the price, you can always expect to be disappointed at the checkout. Planning ahead takes time but will save you hundreds of dollars! Think of all the things you could do with that money saved! So, don’t throw away those ads that come in your newspaper or mailbox! Go through them and circle those things that are on sale that you know you need. Here’s a hint, your lowest priced items will almost always be on the front page of the ad. I’m not saying great deals aren’t to be had on pages 2-8, but always pay close attention to that front page! After you know what’s on sale, you can plan your menus and shopping list. 3. Plan your menus. Grab that collection of recipes now and find the ones you know you can make with what’s currently on sale. If chicken is on sale, cook up some crockpot chicken soup, or some hawaiian haystacks, or chicken enchiladas. If bread is at rock bottom prices, freeze up some PB and J sandwiches or make some french toast for dinner. You get it, right? The point is, to always try and stock your pantry and plan your meals around the items you can get for the cheapest price. After you’ve planned your menu, with those awesome recipes of yours, you’ll obviously have to add items to your list that aren’t on sale to complete your meal planning. You’ll find though, that the more stock up when prices are low, the less you will have to add to your grocery list in the future. 4. Stock up when prices are low. If you see something on sale at a rock bottom price, STOCK UP! If you can afford it, try and get enough to last your family for 6 months because that’s when sales tend to come around again. So, if tuna is at an awesome price this week, figure out how much your family will use in 6 months and stock up. If you can’t afford that much, buy as much as you can. 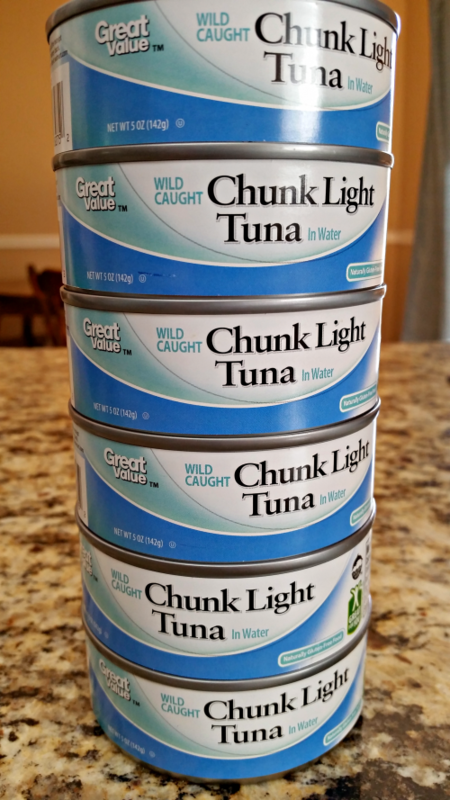 If you continually make a habit of doing this, eventually most everything on your pantry shelves will be ‘on sale.’ So, you know that every time you grab that can of tuna off your shelf, that you got it at an awesome price. If you only buy 2 cans and then have to run to the store next week to get more when it’s NOT on sale, you are wasting gas and money! 5. Invest in a freezer. So, how do you stock up on perishable food with only 1 small freezer? You don’t! You may be thinking “Why would I buy a freezer? I’m trying to SAVE money, not spend it!” Trust me, the money spent on a good freezer, will only save you money in the long run. I never said it had to be a NEW freezer! Look through your local classified ads and find a great used one if need be. If your family isn’t huge maybe you only need a small chest freezer. If your family is huge, invest in a large upright. If you do this, your ability to really stock up when prices drop will increase 10 fold! How much money would you save if you could buy 20 lbs of chicken when it went on sale for .99 a pound, rather than 5 because you know you don’t have enough room in your freezer? Plus, if you have lots of freezer space, you can freeze leftovers for later instead of letting them go to waste. That saves you time AND money. Gotta love that! 6. Cook from Scratch. I know. You’ve heard it before and you’re thinking, “But all those frozen dinners at Costco taste SO good and are SO easy!” Plus, who hasn’t resisted the urge to splurge after trying one of those delicious samples? Hey! I’m not sayin’ I never do the same and SOMETIMES frozen meals go on sale enough to make them as cheap or cheaper than making it yourself. When that happens, you can say, “Hallelujah! I’m so glad I bought that extra freezer!” For the most part, though, meals made from scratch are almost always healthier and cheaper than the ‘pre-made, frozen variety’. If the thought of cooking from scratch just seems SO overwhelming that you would rather die than get out your apron, bowl, and measuring cups, just take it easy now. Start with 1 meal a week. You can do it, I know you can! 7. Stick to the Basics. The more you keep your meals simple, the more money you’ll save. For example, spaghetti and meatballs with a simple side salad can be frugal and healthy, but if you add a lot of unnecessary ingredients, and side dishes, your cost for dinner just doubled! Stock up on the basics like milk, eggs, butter, bread, flour, beans, etc. and then add in the extras only if needed or if they are on sale. 8. Cook a little extra. 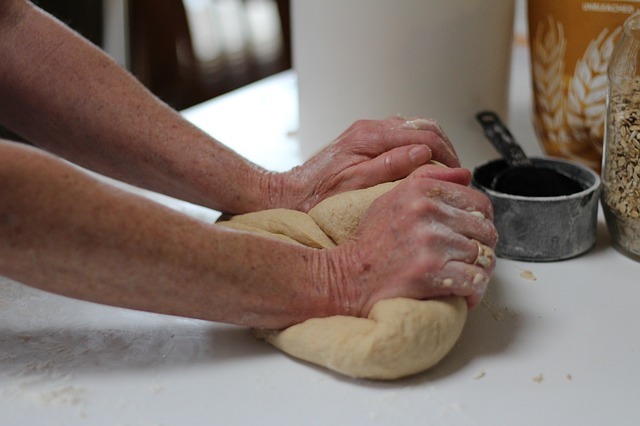 I grew up as the oldest of 7 siblings so when I got married, I was used to cooking double the batch for EVERYTHING. I have always kept that habit even as I’ve had my 4 kids. Cooking is not my favorite thing to do, so I would rather cook up a double batch that we can eat for leftovers later than spend time at the stove every.single.night. But, how does cooking extra save money? It doesn’t cost that much more to throw a little extra in the pot which you can then freeze for another lazy night or send with your hubby for lunch the next day. We save a lot of money on my husbands lunches when he takes leftovers instead of buying lunch. 9. Use less of what costs the most. So, what costs the most? That will vary for some people. For me, it’s meats, dairy, and packaged snacks and treats. So, if you want to really save money, make these items stretch a little further or don’t buy them at all. 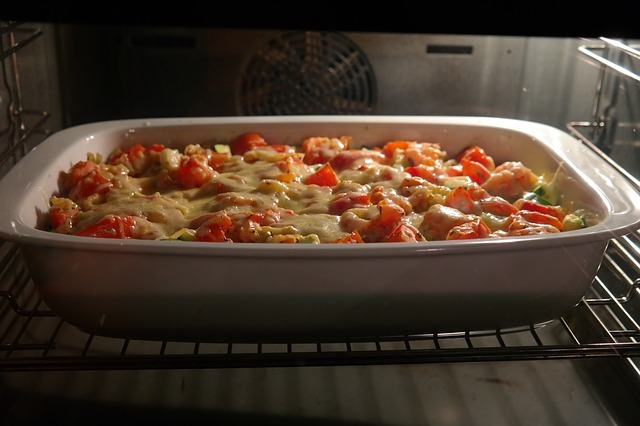 You can use half as much cheese or meat and still have wonderful meals. Recently, my family has been forced to stop eating dairy, because of children with allergies. I was dreading not having milk and cheese and yogurt in the house but I’ve been pleasantly surprised at how we’ve been able to live without it. I also love not seeing those budget busters on my grocery list anymore! 10. Grow a garden. Yeah, I’m still learning how to do this one! Last year I finally got ambitious and grew my own vegetables. It was awesome to just go in the backyard to pick what I needed. Think of how much organic produce costs at the store. 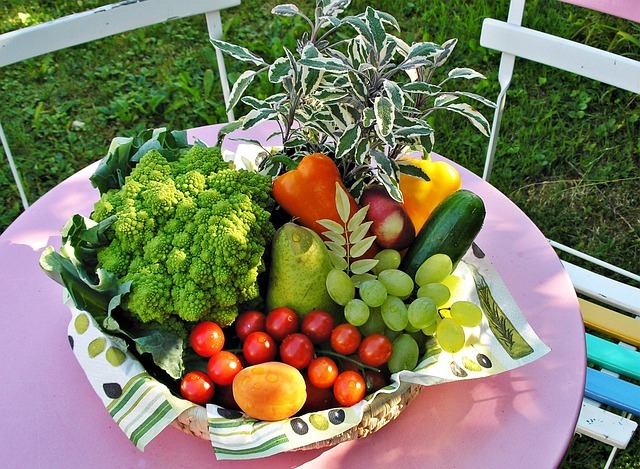 If you grow your own, (and don’t use pesticides) it’s ALL organic! Plus, you can freeze all the extras (in your awesome extra freezer) to use during the winter! 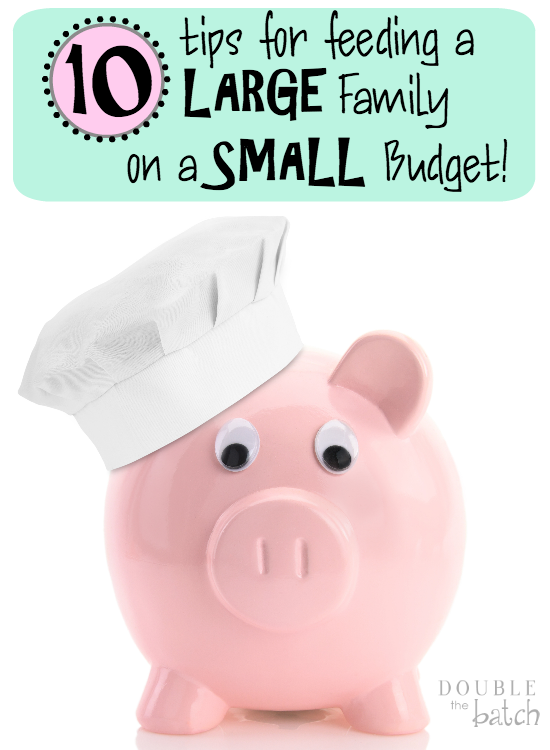 Good luck in your all your efforts to feed a large family on a small budget. Coming from one myself, I can honestly tell you, it CAN be done! Waste not, want not, and get on with the rest of your life!